“Ma,” Tony begins, but she holds up her hand. “Did you eat half of it while you were cooking?” I ask, attempting to make her smile and quell any further drama. “Why you not shave this beard?” MG asks. I get crepes with crème anglaise, because they don’t serve gin at this hour. Tony, who’s on a new health regime, orders a breakfast panini. “Look what you’re forcing me to eat,” he tells me, in a pained voice. 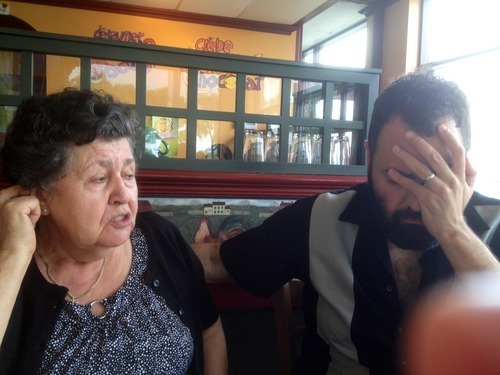 “But I’m not having toast!” Tony interjects, and Mama Greek, hearing this, gasps. “No toast? Why?” MG glares at me, accusingly. “You see what she’s doing to me, Ma?” Tony says. Mama Greek orders a plate of pancakes, and eats every single one of them. After breakfast, we go to the cemetery to visit Papa Greek’s grave. MG goes through her usual routine: putting new flowers in the vase, dumping the withered ones on the next grave over, arguing with Tony about the candle. Then we stand together and look at the headstone. As I always do when I’m here, I try to feel some connection with Papa Greek, but nothing comes. Still, I find there’s something beautiful and calming about the cemetery - of the reminder that this is how we’re all going to end up, in one way or another. We go back to Mama Greek’s house to pick up the lentil soup, souvlaki, corn etc., and when we let Ruble out in the backyard, she shows me her garden, which she’s just started to maintain again for the first time since Papa Greek’s death. She points out the perennials, marveling at how they’ve grown despite not being watered or pruned. I notice how happy she sounds, and realize, suddenly, that she didn’t cry at the cemetery. When I’d joked with her, over breakfast, about getting a new boyfriend, she didn’t even bat an eye. “I’m too tired to take care of someone else,” she said, as if, otherwise, it would be a totally feasible option. As we drive home, I think about how rarely I put myself in Tony’s shoes, with regards to losing his dad. I know why this is: it’s just too hard. Picturing life without my father is terrifying. It’s something I can’t even fathom without falling apart, and yet, when we’re at the cemetery, I fool myself, trying to believe that losing Papa Greek affects Tony the same way it does me. I forget about the giant hole that’s still in his life. A few days later, I phone my dad. I’m stunned. My dad’s mother died 32 years ago, and he’s not that sentimental of a guy. “I go every year,” he says. I’m speechless. I want to tell him what I’ve been thinking lately, how afraid I am of him being gone one day, and how much he means to me. But he gets uncomfortable with that kind of talk, and quite frankly, I don’t think I’d be able to say it without losing it. “That’s really nice, Dad,” I say, instead.